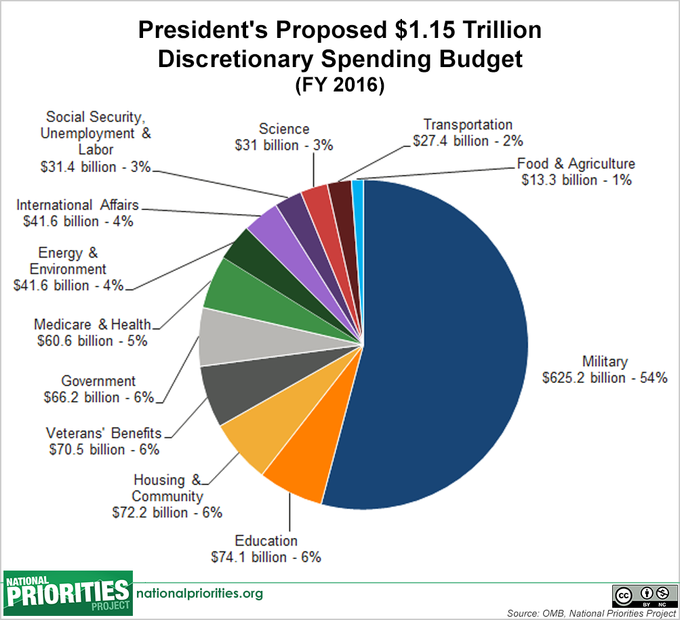 Military spending of $625 billion would account for more than half of discretionary spending under the president's proposal, leaving just 46 percent of the discretionary budget, or $530 billion, to spend on all non-military discretionary programs. For all the pictures that tell the story of the president's budget proposal, check out The President's 2016 Budget in Pictures. Where Are We in the Federal Budget Process? State required Alabama Alaska Arizona Arkansas California Colorado Connecticut Delaware District of Columbia Florida Georgia Hawaii Idaho Illinois Indiana Iowa Kansas Kentucky Louisiana Maine Maryland Massachusetts Michigan Minnesota Mississippi Missouri Montana Nebraska Nevada New Hampshire New Jersey New Mexico New York North Carolina North Dakota Ohio Oklahoma Oregon Pennsylvania Rhode Island South Carolina South Dakota Tennessee Texas Utah Vermont Virginia Washington West Virginia Wisconsin Wyoming Outside U.S. Your gift helps NPP build a better budget for our nation! Make your gift now to support our work.